Please scroll down to register your player using our online form. All Junior outfield players and keepers are welcome at GHC for our Easter Camp - we have a real treat for you including international players, professional coaches and specialist goalkeeping. There may be other courses out there during half-term but ours is expertly designed and sourced by Dan Fox and in collaboration with Fortitude Hockey UK Ltd who are a real force in GK coaching both here in the UK and in Belgium. Superb coach to player ratios and outstanding playing and coaching experience mean your player will learn a lot, be inspired and have fun. Timings 10am-3pm each day; arrival from 9.40am please. Goalkeepers, please note that the specialist keeper training day with Fortitude is Thursday - please make sure you book for this day. Monday and Tuesday will also be terrific experience - discounts for those attending multiple days. Please register as soon as possible so we can get start to plan the groups and sessions in detail as soon as possible. Non-GHC players also very welcome. We plan our courses according to the number and ability levels of players attending. 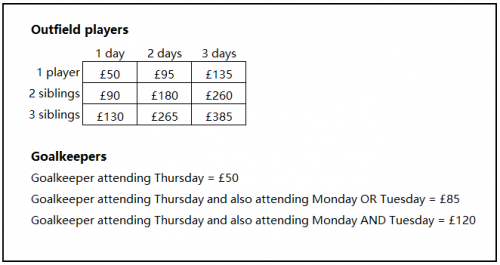 It is difficult to add coaches within 10 days of the start of the course. Please help us by registering and paying early to avoid surcharges. Please make your payment as soon as possible by BACS. Cheques can be accepted but BACS is much easier. If you need to pay by cheque, please follow the instructions below. Please complete a separate form for each player due to different medical information and consent. 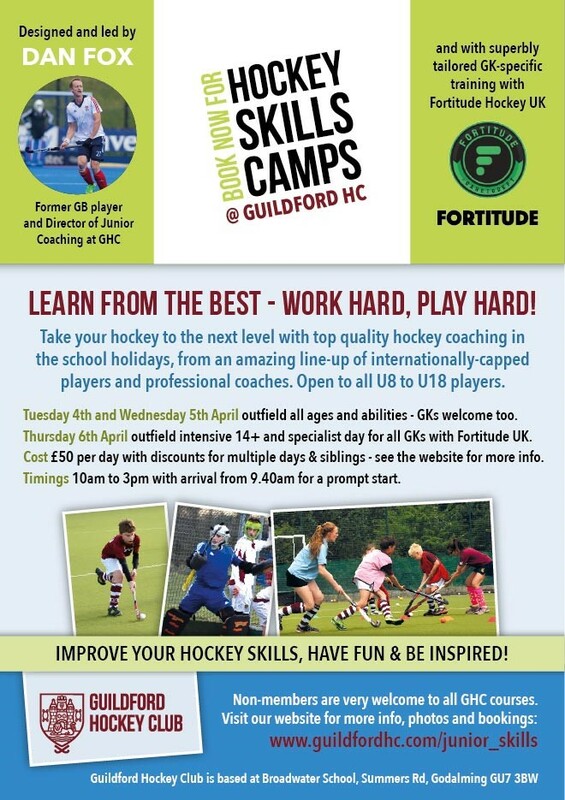 Photographs and/or video may be taken during matches and training session by approved agents and officers of Guildford Hockey Club or Fortitude Hockey UK Ltd. Some images may be used for publicity and training in accordance with the England Hockey Safeguarding and Protecting Young People Policy and Photography Policy. By choosing yes, you consent for your child to feature in such images which may be used for marketing purposes, eg local newspapers, magazine, promotional articles including flyers, brochures or website. We do not publish full names with photographs. When you have completed the form, please click the 'Send details' button ONCE to send (you can complete the form again for another player).